The ingredient I am working with this week is cherries. 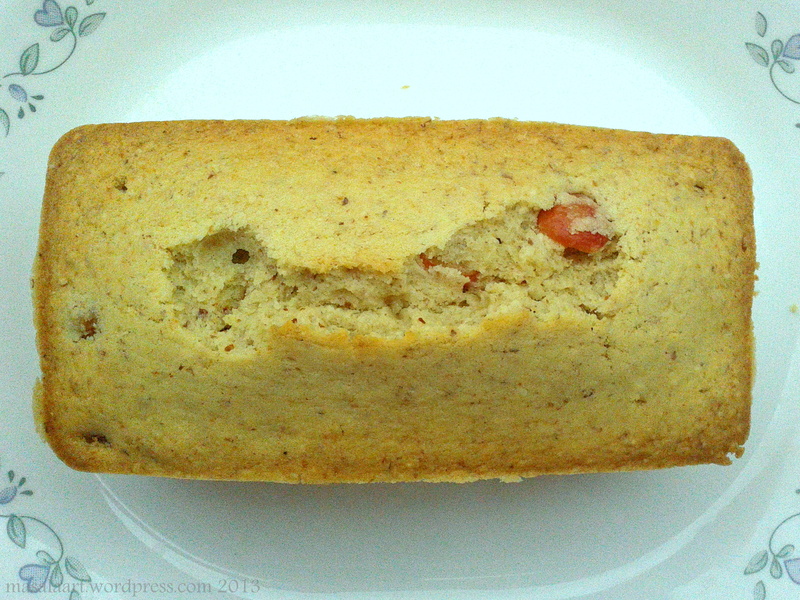 And since I love baking, the first recipe post for this week is a cherry and almond loaf cake, from Nigella Lawson. The recipe is simple and uncomplicated and calls for candied glacè cherries. I have eaten lots of glacè cherries as a child- there used to be a bakery near my grandmother’s house that sold them in little sachets, and I’d sometimes pick them up on the way back from my math tutor’s house and eat them in secret. Sometimes, to the point of being sick. They are pretty wonderful. BUT since I bought desi cherries, I had to make do. The cherries were sweet, but not sweet enough for my liking- so I decided to let them macerate in a some sugar and lemon juice for a bit. I always wondered what ‘macerate’ meant…I mean, it sounds like a fatal, sinister thing that would happen to a fruit, right? (Did you hear about those strawberries from Mahabaleshwar? They had to be macerated. The entire box of ’em. Just weren’t sweet enough. Shudder.) But I watched a cooking show and soon figured out that macerate was a method used to soften fruit to break it up. Anyhow. I let the cherries macerate, drained the syrup and patted dry with a kitchen towel. Then I got on with the rest of the cake. Place the chopped cherries in a bowl and mix well with the sugar and lemon juice. Let it sit for 15 minutes to half an hour. (If you have more time on your hands, let it sit for longer.) Once they have soaked up some of that lemony syrup, drain and pat dry with a kitchen towel. In a separate bowl, toss the cherries in a little flour and keep aside. Seive the flour + baking powder over the batter and fold it in. Fold in the ground almonds. 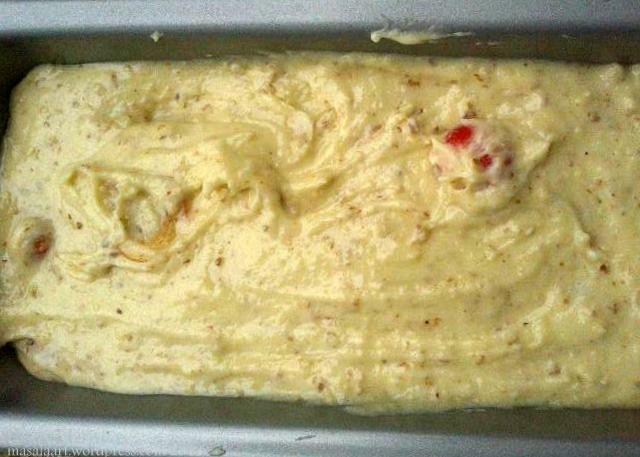 The batter may look like it is too dry, but it will come together. Just keep folding! Fold in the flour-dusted cherries, followed by the milk. You will get a thick, slightly sticky mixture. Pour the batter into a 6-inch loaf tin and bake at 170C for 45 minutes to an hour or until a toothpick inserted comes out clean. I’ll be honest with you- this cake is nice, but I’m quite certain it is more ‘meant to be’ with glacè cherries. Their firm, waxy texture would add a lovely bite and make them stand out more. These cherries really would have been lost if I had not macerated them. (Oh, the poor dears.) Either way, it is still most agreeable as far as an afternoon tea-time nibble goes. And yes, it was fun…and that’s an important aspect of being in the kitchen right? « Summer Fruit Fun: Cherries! This is one of a kind delicious looking cake! Great idea to “macerate” the cherries in a sugar lemon syrup, I’m sure the contrast of sweet and sour makes them so tasty. Thanks a lot Daniela! 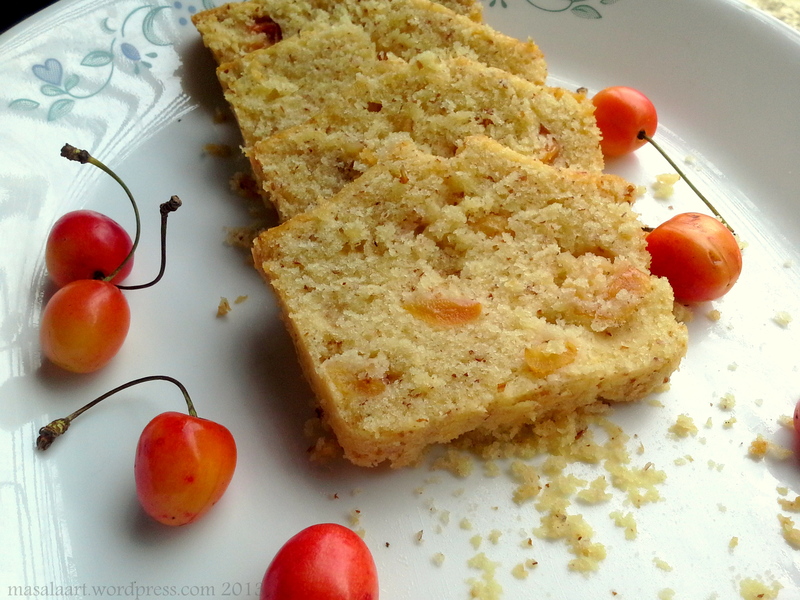 The cherries were ok- the lemon juice helped, but I actually wish I had used glace cherries. Beem awhile since I’ve made a Nigella recipe. This looks great! Thanks! You know, with Nigella’s recipes, so far I have had an equal number of hits and misses. Either they turn out well or they kind of bomb. But her store-cupboard chocolate orange cake I can vouch for!